Bruce Springsteen said that to Pete Seeger at a tribute on his 90th birthday, one year after they played “We Shall Overcome” together at Obama’s 2009 inauguration. Seeger died last week at age 94. He was born in 1920, and spent his whole life singing songs and inspiring generations of people to fight the good fight, for the little guy, for workers, for people on the outs, for peace, and for the planet. He was Woody Guthrie’s protege, hitchhiking, riding freight trains, and singing in saloons with him in the 1940s, learning and spreading American folk and protest music (“This Land is Your Land”). He was blackballed by Joe McCarthy and the anti-communist movement in the 50s, but came back even stronger as a force to inspire the civil rights and anti-war movements in the 60s. He fought GE in the 70s and 80s and forced them to clean up all the PCB’s they’d dumped in the Hudson river. And up until last week, he lived a simple creative life in the log cabin he shared with his family, chopping wood every morning and holding protest signs (anti-Bush and war) by the side of the road in the freezing cold well into his 80s. He shunned recent efforts to make him into a sainted celebrity – it was never about him, he saw himself as part of a continuing wave of ordinary people pushing for good. If you want a quick dose of what he was all about, watch this awesome documentary, The Power of Song, available to stream online on PBS, (http://www.pbs.org/wnet/americanmasters/episodes/pete-seeger/full-film-pete-seeger-the-power-of-song/2864/), or buy on iTunes. You’ll be glad you did. For one, excellence: Seeger was the best at what he did – an awesome musician, singer, songwriter, and promoter of his own and other artists’ work. For another: inspiring kids. When Seeger was forced off the airwaves and blacklisted so he couldn’t get jobs, the only gigs he could get were as a music teacher at schools and summer camps, and playing the college circuit. So he spent the late 50s and early 60s cultivating a whole generation of kids with songs about the past and the future, about hope and fighting for good against the larger forces of greed, corporations, discrimination and abuse of power. 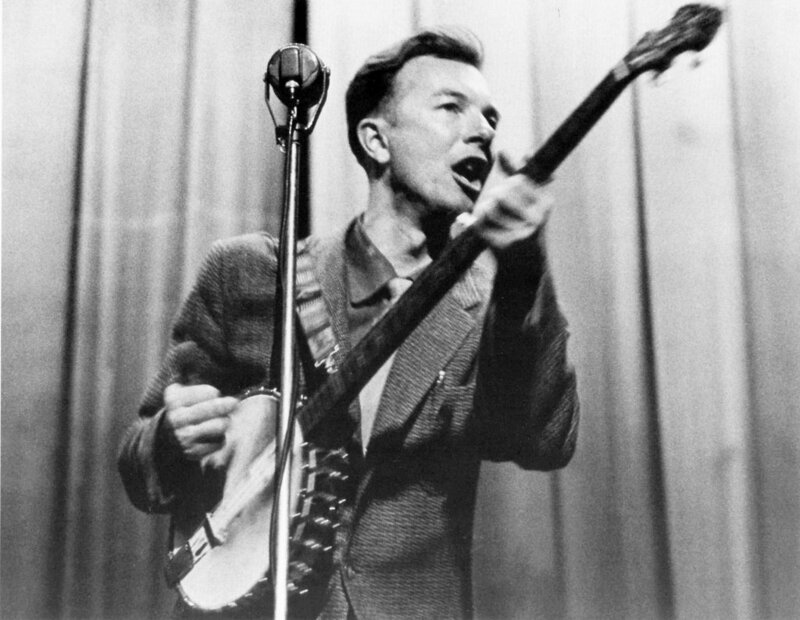 When I was four in 1968, my parents had Pete Seeger albums playing nonstop in our house (thanks for that! ), and that music inspired something in me like it did many other people. Finally, Seeger had staying power, and he just kept getting better. Through decades of ups and downs he kept singing songs, loving it, jamming with other great artists (Johnny Cash, Bob Dylan, Springsteen), and believing in people and that good would triumph. At least for him, living a long (and good) life turned out to be not about money and fame but about just enjoying what he was doing and sticking with what he believed. And along the way, he wasn’t afraid to be different, to forcefully and with conviction swim against the tide (‘the bastards’). I won’t editorialize any further other than to say that I hope we as a company and as individuals can aim to do all of the things Seeger did: Be excellent, inspire LOTs of kids, have staying power and have fun while we’re at it!